Newly released broadcast quality CMOS 3G-SDI camera leads early July sales orders. 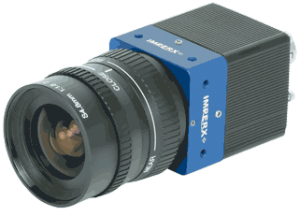 IMPERX, Inc., Boca Raton, Florida, July 2017 – When Imperx introduced its new 3G-SDI CMOS camera at the Automate 2017 show in Chicago, Ill, expectations ran high for a successful follow-up market release. Based on early July manufacturing orders, those expectations were justified. The Imperx Cheetah C2010, 3G-SDI CMOS camera accounted for 50 percent of all manufacturing orders in the first week of July. The impressive results indicate a healthy customer demand for the broadcast quality C2010 industrial camera and its superb sensitivity and dynamic range. The C2010 provides 1080p resolution and frame rates up to 60 frames per second. It is compatible with 3G-SDI (SMPTE 424-1) or HD-SDI (SMPTE 292M) output standards and ideal for aerospace, medical, scientific, transportation, and similar applications. The camera’s dynamic range extends up to 71 dB. “With the camera’s speed, image clarity, small size, and low power consumption, you can see almost endless uses for it,” says Petko Dinev, Imperx President and CEO. The camera’s 37mm x 37mm x 50.8mm size is designed for installation in constrained environments. Its Pregius IMX-265 CMOS image sensor and Imperx engineering expertise combine to produce exceptional performance along with features such as tri-level sync, strobe output, automatic exposure / gain controls, and multiple lookup tables (LUT). The camera is ruggedized to operate across wide temperature ranges and within extreme environments. Like all Imperx, cameras, the C2010 is made with high quality, industrial grade components. IMPERX, Inc. is a leading global designer and manufacturer of high quality, ruggedized digital CMOS and CCD industrial cameras, and imaging systems. Visit the Imperx web site for the latest information on our broad line of Camera Link®, GigE®, USB3 VisionTM and CXP CMOS/CCD cameras and frame-grabbers or call Imperx at 561-989-0006 to talk with our technical sales associates.